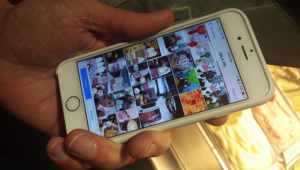 This blog post is the first of three that details the main findings from Imaging Sheffield — an ethnographic study that formed part of the Picturing the Social project at the Visual Social Media Lab. The aim of the Imaging Sheffield study was to find out some of the reasons why social media users share images of Sheffield online. What kinds of location specific narratives were being enacted through these photographs? And how do images act to reference and consolidate particular identities? This first case study, of a local dairy farm, enabled me to explore how images of Sheffield can be used to express a series of complex ideas, in relation to the value of ‘localness’ and the importance of heritage. 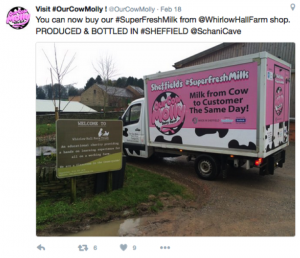 Our Cow Molly is a family-run dairy farm located on the outskirts of Sheffield. The business has an active presence on social media, with Twitter being the main means by which the company communicates with a mixed audience of customers, stockists and the wider public. The Twitter feed is run by Edward ‘Eddie’ Andrew, who is a prodigious tweeter, having sent over 45 000 tweets since joining the site in April 2009. As part of this research, I followed the Our Cow Molly Twitter feed for 12 months, and conducted an in-depth interview with Eddie. I also used an adapted form of participant research, which I will discuss below. Eddie took very seriously the process of selecting images for the Twitter feed, and sorted his photographs into various folders on his phone, relating to deliveries, customers, stockists and so on. This categorisation of images enabled him to quickly select, and often combine, the right kinds of visual material to accompany his message. Through observing the Our Cow Molly Twitter feed, I noticed that a great many of Eddie’s images were used to reference, as well as depict, Sheffield, and specifically, the provenance of his milk as being from Sheffield (see image below). 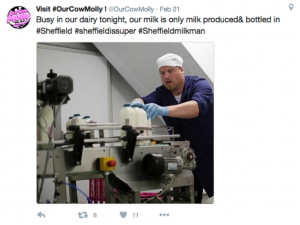 I sought to find out what being visually shown as from Sheffield meant for his business, in terms of encouraging customers to not just choose his milk, but to do so over cheaper competitors. Images, in this context, are therefore a means for keeping the business viable in a hostile commercial environment for small dairy farmers. 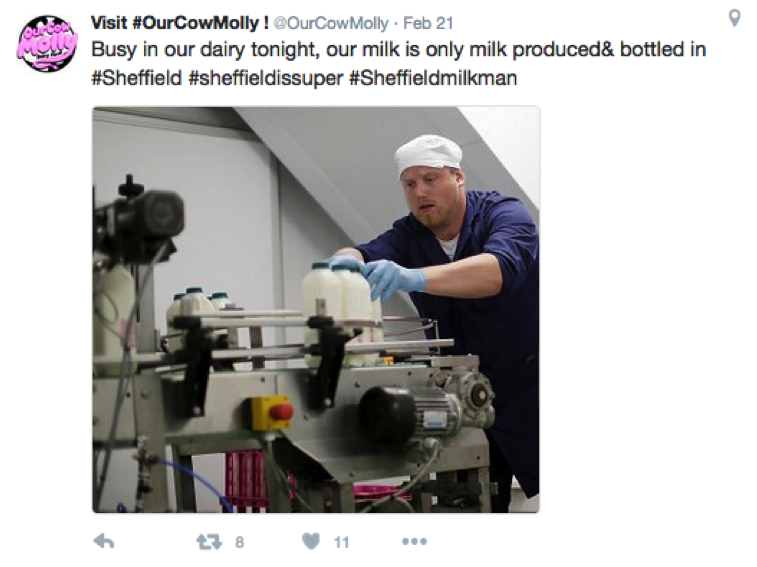 The provenance of the milk as being from Sheffield references a wider cultural shift towards locally sourced foods. The ‘locavore’ movement proposes that some of the problems of the industrial processes of producing and transporting food can be ameliorated by buying goods that originate from closer to home. Although Gray points out that the ‘locavore’ approach is not without its drawbacks, especially concerning the migrant populations who frequently staff the smaller farms in the US (2014), Eddie’s emphasis on being ‘local’ is a response to a shift in the way food is valued within society. In particular, he is arguing for the value of independent food producers, and the need to support business such as his farm in the face of supermarket competition. One aspect of the value of being local is the potential for being fresher than goods shipped over larger distances. 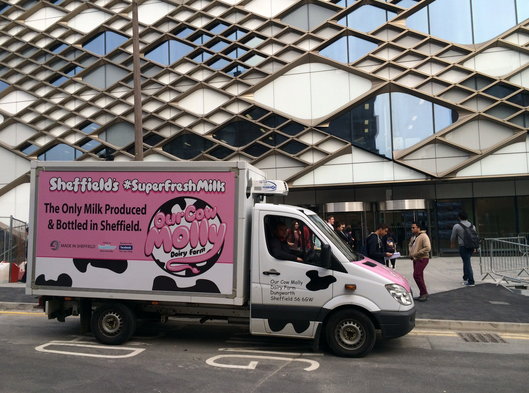 By emphasising the production and circulation of milk within Sheffield, Eddie is referencing a longstanding cultural association between freshness and quality. As Freiberg points out, access to fresh food was traditionally an indicator of wealth (2009: 7), and even now, when fresh food is ubiquitous, “the most status goes to whoever can find and afford the absolute freshest product” (2009: 8). Eddie’s extensive use of the hashtag #superfreshmilk is therefore not just an expression of his milk’s taste, but also of its status as superior to the alternatives. Eddie also described how this status was being signalled in images, such as the one below, that depicted his cows in fields. 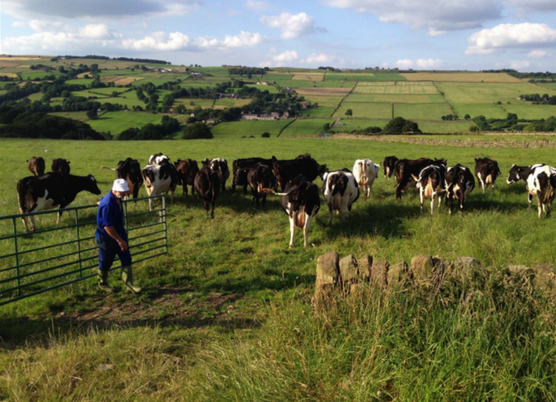 As Eddie outlined, cows in fields can be used to signal a particular ‘free range dairy’ approach to animal care. He saw the positive associations of this kind of movement and space as being important messages for his business. Furthermore, the image above also appealed to him because of the juxtaposition between elements of rural Yorkshire life — such as the dry stone walls — and the city of Sheffield, that he knew lay just over the hill. Therefore this image conveyed a message of not just proximity, and the positive associations of localness and freshness that this implied, but also of an appealing sense of difference and escape, yet still within the city boundary. Our Cow Molly, when depicted in this manner, could therefore be seen as positively Sheffield and non-Sheffield simultaneously. 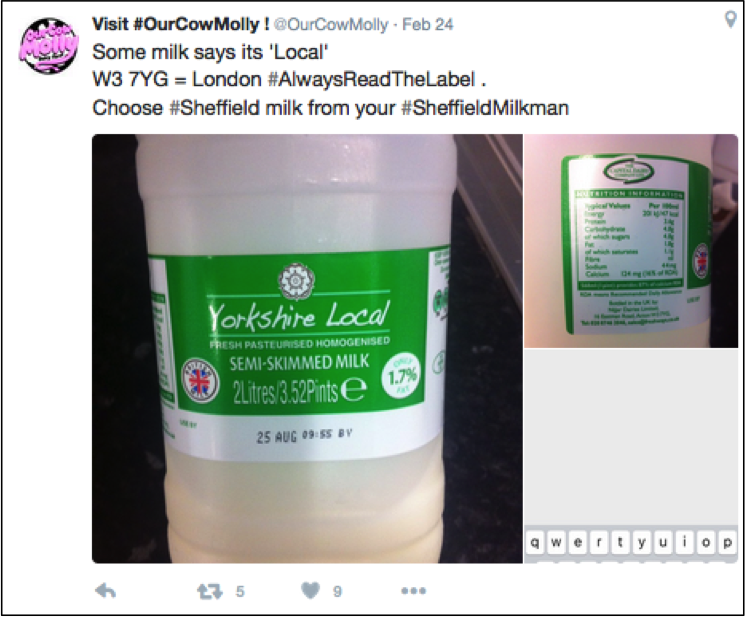 As visible on the Our Cow Molly Twitter feed, the value of ‘localness’ is a concept that needs policing. In the image below, Eddie identifies a supermarket milk carton that claims to contain Yorkshire milk, yet whose postmark is in London. To Eddie, this inauthentic example of ‘localness’ only serves to underscore the importance of buying the ‘real thing’. In our interview, Eddie expressed an interest in using images to show viewers the production process of the milk, in terms of (what he called) “cows to customers”. This depiction of the supply chain enables viewers to see how their food is made — in terms of where and who by — and demystifies a process that is usually hidden from view. This act of showing milking and delivering is therefore another means by which Our Cow Molly aims to position itself as meriting its customers’ support, as it reveals itself to the viewer in a way that is both educational and indicative of pride in a job well done. 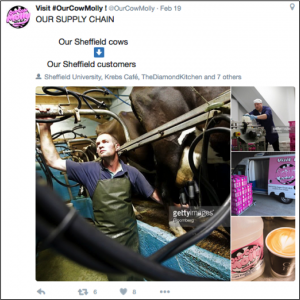 Lastly, the visual referencing of Sheffield also conveyed a message regarding Our Cow Molly’s position within the wider lineage of Sheffield’s industrial heritage. 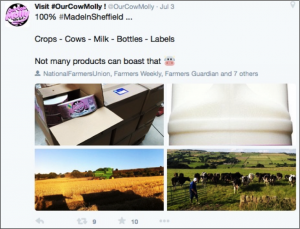 In images such as the one below, Eddie emphasised the status of the milk as being “Made in Sheffield”, from the bottles and labels to the cows and grass. 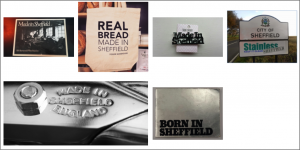 Made in Sheffield is a concept that holds a particular status for the residents of Sheffield, as it recalls a period when the city gained international recognition for the quality of its manufacturing. Although these industries no longer employ the number of people they once did, this is still an important idea within the local imaginary. Eddie only began to appreciate the importance of this message when he labelled his ice cream as “Made in Sheffield” and saw his sales sharply increase. In his words, this status gave him “a totally unfair advantage” over his competitors, as customers strongly valued Sheffield-made products. In order to understand how some of the ways in which the concept of Made in Sheffield was expressed in local culture, I began collecting examples of the phrase: in books, on bags and even in the form of jewellery. I also looked at the ways in which Sheffield’s heritage also extended to ways of living within the city (see the sign exhorting residents to Keep it Clean: Stainless Sheffield) and even to ways of identifying those who live there (in the form of the Born in Sheffield title for the baby book given to new mothers in the city). I also took several walks in the city, tracing the presence of Sheffield’s industrial heritage in the form of hotel names, pub names, public art and adverts. I detailed this process in this blog post here. This kind of exploratory approach enabled me to appreciate “Made in Sheffield” as what Raymond Williams called a structure of feeling, and as a concept that holds a significant position within local visual culture. In summary, the Our Cow Molly case study demonstrates how images can be used to express a particular identity and set of values, based upon proximity, localness and the importance of being visibly from Sheffield.